I recently switched to using more prefolds with covers to cut down on laundry (usually you can reuse the cover) while I’m out-of-commission with my broken leg. It’s been great! I was typically washing every 2-3 days and washing between 12-20 pocket diapers at a time. But, since I switched, between Saturday morning and Monday night I only had 10 diaper shells in the wash! If I would stop using pockets completely it would have been even less. I’m even more excited at the prospect of less laundry because of our newest addition arriving in July! I had already planned to use prefolds and covers on the baby, but cutting down Raegan’s diaper laundry is an added bonus! 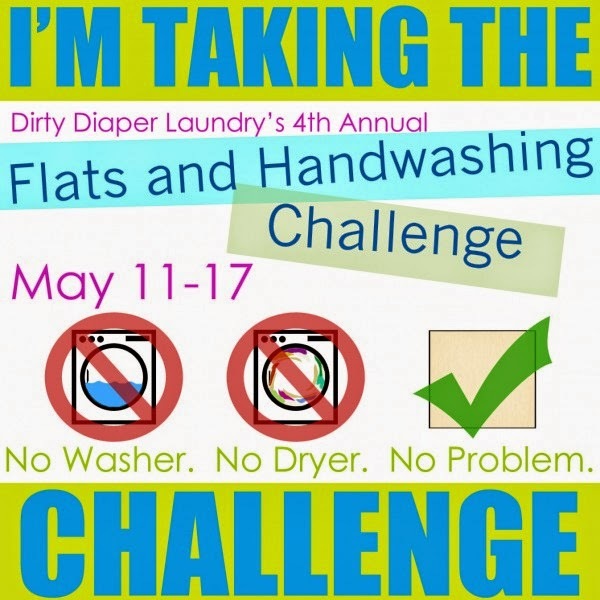 And, because I’ve been spending a lot of time on the couch and I will hopefully be feeling quite a bit better in a few weeks, I signed up for the Flats & Handwashing Challenge this year. I also read how to fold an old t-shirt to use as a flat, which I might try because I have a lot of old t-shirts laying around. Maybe we can get Daddy to clean out his t-shirt drawer, too! Covers: I’m going to use my Softbums shells, just so I can reuse them and not wash as many shells every day! The Echo shells are just like a regular cover and the Omni shells can also be used as a pocket. I have a few of both! I have a package of Dappi covers that I have never opened from when Raegan was a newborn and I have some Size 1 Thirsties Duo Wraps that I’m sure would fit my skinny toddler so I will use those as back-ups if I have to. I could also stuff her pocket diapers with flats but I’m not sure how absorbent that would be. Washing: I haven’t quite figured this part out yet. I think I am just going to use the trash can that I use as a diaper pail and the plunger we already have, instead of making a “camp washer”. I should do a test run, but I’m having surgery next week and I don’t think it will be high on my priority list until later in the month. Drying: I love my clothesline. On rainy days, I hang diapers on pants hangers on my shower rail. I would love a pulley clothesline like this one. But, I don’t think there is a chance I’ll get one installed before the challenge. So, I’m excited to try out something new! And, hopefully I’ll get really good at handwashing and we can do a lot of camping without worrying about laundry!! 🙂 I’ll post about the challenge while it’s going on and you can sign up here if you’d like to participate with me!